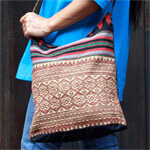 Working with cotton, the artisans of northern Thailand craft shoulder bag by hand. 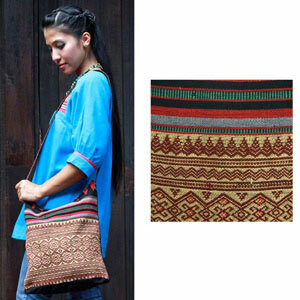 The body features textile hand-woven by the Naka ethnic minority people and the strap is made with leather. Fully lined with cotton, this unique accessory hides three inner pockets. It closes with a zipper. Materials: 90% cotton, 10% leather. Lining 100% cotton.